Some people may argue that After the Rain is the love story of Avelino and Nate, two people whose lives have taken them down very unexpected paths and in the end find love. But I would argue this is more a story about a broken, lost, young girl who is drowning in life, who needs help, love, direction and more importantly forgiveness from herself. Yes there is a love story, but for me what I walked away with was an example of the importance of finding balance in life, learning to fight for what you want and that there is more to life than just work! Death, guilt, anger and depression are all strong emotions and have the power to cause a person to literally lose sight of themselves. Avelino is beyond lost and Nate's unexpected arrival is somewhat a catalyst, a tiny step which stirs emotions, which pushes her towards a future. But it's not an easy journey and it takes what seems like forever for Avelino to wake up and become her old self! I loved the concept of this story, I loved watching Nate finally open his eyes and realize there is more to life than work. It truly was beautiful to see how his emotion and love for Avelino shape him into a more complete man. Finding something to live for other than yourself was his lesson and once he learned, once he realized he was in love, I really fell for him as a character. My favorite part of this book was the end. It's when I first felt connected to the characters, I wish I could have had more time with Nate and Avelino finally on the same page at the same time! Reading Nate's inner most thoughts, watching him grow, and the way in which Renee Carlino tells this part of the story was truly unforgettable. My only complaint was not feeling emotionally connected to the characters. I wish I could pinpoint why, but I'm just not sure. 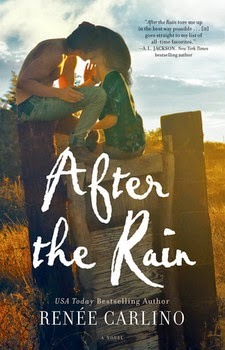 If you're looking for a good read with a very sweet HEA then take a chance on After the Rain.